Are wine and alcohol are forbidden in Islam? Does the Qur’an permit strong drink (intoxicants)? However, Quran 2:219 appears to prohibit wine and other intoxicants. Why was wine permitted to the Jews (Deuteronomy 14:26; Psalm 104:14-15)? Why did Jesus change water into wine (John 2:1-11) and include it in the Lord’s Supper? Are you thinking about converting to Islam? Source: Kueny, Kathryn, “Wine”, in: Encyclopaedia of the Qurʾān, General Editor: Jane Dammen McAuliffe, Georgetown University, Washington DC. Wow, I mean, your interpretation is off the hook. In 16:67, there is no wine involved. AT ALL. Its what you interpret it to be…. What you want it to be. and the second verse, yes, Allah said there is some benefit in wine but more evil. Taht is so clear. 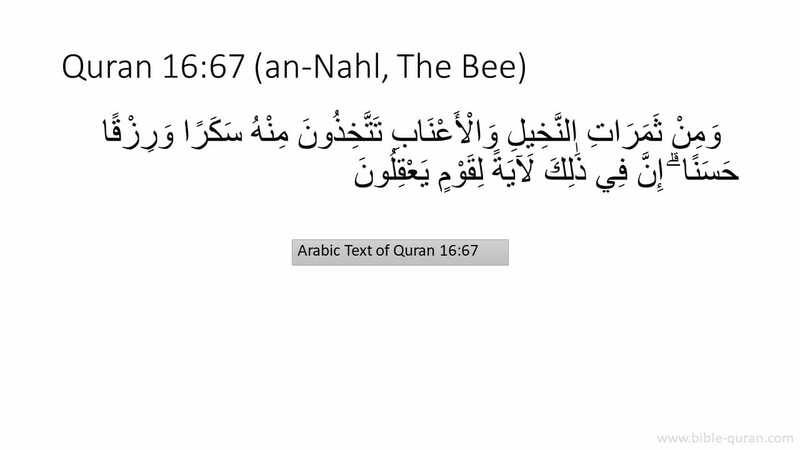 He is telling you, there is benefit in it, but the harm is greater so stay away from it. How does this say its ok to drink it??? I was born and raised Christians. I am very happy I left it. There is no verses in the Bible about Trinity, none about Jesus saying worship him, but plenty saying not to. Many verses about having a lot of wives though Islam just limited it to 4 instead of 50 or more people used to have. I mean seriously… there is no compulsion in religion….but the truth is seen from the lies. It is true that the word “wine” is not found in Quran 16:67. But wouldn’t you agree that wine is meant by the reference to the intoxicant taken from grapevines? Don’t other Muslim interpreters understand this to be wine? As for the issue of Christian doctrine and the Trinity, I would encourage you to start first with the Christian understanding of history and the death of Jesus on the cross. Christianity doesn’t tell you anything about the bible and trinity .. Its all made up and they call it study of bible ..If this is true, then why cant I do my own studies? Psalm 2:7 I will tell of the decree: The LORD said to me, “You are my Son; today I have begotten you..
my brother you just miss quote 2 corinthians 4:4 or you do not understand it at all and do not speak what you do not know…….it says the god of this world….. catch that phrase….god of this world. now you said you once where a christian so i take it you can say ‘our lords prayer’ if you know the phrases there it say ……thy kingdom come, thy will be done on earth as it is in heaven… now ‘thy kingdom come’ shows that Gods kingdom has not yet come on earth in otherwords God is only ruling in heaven, for now He is not ruling the earth but satan. going back to 2 corinthians 4:4 it says god of this world which is satan so don’t say satan is God. Now going to the Psalms you quoted yes David is Gods son as a matter of fact every person that believe in God is Gods son. The Bible is very clear so when you try to read the Bible, please ask the Holy Spirit to give you revelation about what the words of the Bible mean. Don’t just read it as any other book. As you can see that verse you have quote saying that satan is God well, you have to differentiate between God and god, and try to understand that when satan was hurled down from heaven, his kingdom is here on the world, and because he knows his time is over, he is busy harvesting souls to his kingdom; those who doubt the word of God and those who live according to their evil sinful desires of the flesh (body ). And that’s why we should live far from the body and walk in spirit. 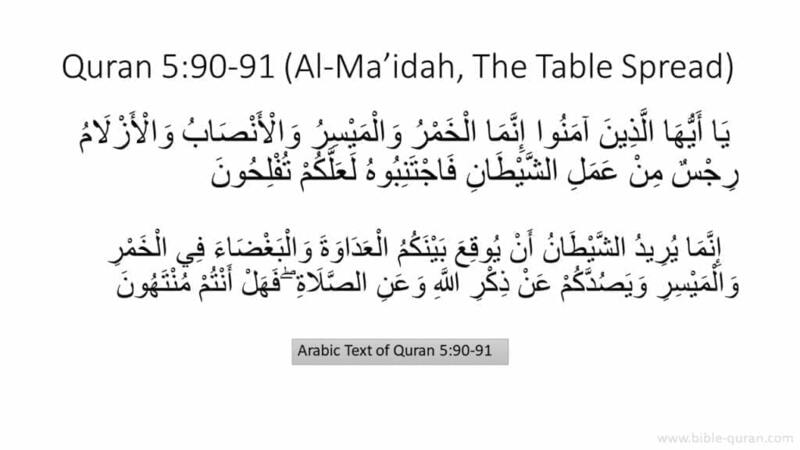 There is averse (5:93) in the Qur’an, which conceivably came down after the prohibition verse (5:91) whick closes the debate. God will not take people to task for what they ate or drank as llong as they remain committed to good deeds and taqwa. Thus from the Qur’anic perspective, drink is a fair prosion, has some good but more of evil, causes disorientation so one should not approach prayer as he would’nt know what he is saying, it is a handiwork of satan as drunkenness causes rift in family and a lot of social problems, but God is afterall not going to judge people on whether or not they drank. It is upto the reader to think whether Muhammad cooked it up or it all fits in beautifully. Theer is no compulsion in religion.If he was cooking up the revelations, why couldn’t his learned companions who later became great conquerers and admininstrators of thier era and changed the course of history catch him. Anyway, he is dead 14 centuries ago and if some or a lot of peopl think he was an imposter, it is not amazing as may of the Meccans in Muhammad’s era thought so. Well, if you still think he was an imposter, no harm. God will not judge you on what you think of Muhammad but on what you do. Be a good Christian. Dont hate Muslims – though you may hate Islam and Prophet for there is no punishment on harboring evil thoughts about the Prophet or Islam as long as you have faith in God, do good and keep from gross appetites of life and do not hate fellow humans. Read it in Arabic. It is clear not only was the original verse about wine but it refered to being drunk. I don’t think M knows his religion very well. As a Muslim I believe in the divinity of the Bible. The incongruities that you have pointed is inevitably the result of translation from Hebrew to Aramic to Latin to English, and the long span of its compilation by different saints and scholars dating from Moses’ era, and its recurring editing over time. I welcome you as a convert but warn you that a good christian may stand ahead of a bad Muslim in the divine court. Translation from Hebrew to Amareic to Latin to English? Why not from the original hebrew and greek to english directly? The latin version was not the basis for any modern english translation. The textual critics (which is a science) say the Bible is the most well preserved collection of ancient texts since we have tens of thousands of 1st and 2nd century manuscripts. Independently, jews and christians have memorized and copied the Torah and Tanakh and New Testament for centuries and NO proof of corruption was ever produced, except grammatical variants which dissappear once you look at the whole. Muslims have never offered proof of what the “original non-corrupted” Bible was supposed to say and what it says now. It’s just wishful thinking because if it confirms the Quran they accept it and if it contradicts the Quran they say it’s corrupted. As for Psalm 2:7 you may not understand it but it does contradict the Quran where it says Allah is a father to noone. yes, ilah means god but allah (al ilah) means the god. Could be because Islam was invented after Christianity existed and therefore contained some scripts from it. It seems to me that koran has a lot of contradictions. Don’t get me wrong, I too have read the so called ‘101 contradictions in the Bible’. But did you know what i found? Most of the time, the author was in wrong. You can’t just read by only a fraction of the verse. Bible is like a book of history. Old testament and new testament may look contrasting each other because old testament is about history and Torah while new testament is about Jesus and Christianity. I know that salvation is like everyone for themselves, but I trully want people to be saved. Try reading Bible and discover true salvation by yourself. After all, if Islam is the true path, why is the sentence of turning back on it is death? What is it afraid of? Don’t you think it once again contradicts itself being touted as religion of peace? Firstly, u have to give out the verse that says turning back from islam is a death. And mind you, If you are unable to produce that verse, take this verses from the bible. 1samuel chapter 15 vs 3, where Saul has been commanded to go to the city of amalekite to killed and destroyed everything, even not to spare anything. And 2chronicle chapter 15 vs 13 which says he who does not seek the God of Israel must be put to death, from small to big.